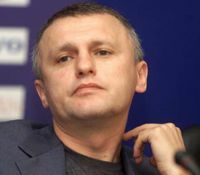 President of Kyiv Dynamo told about transfer priorities. In summer Kyiv “Dynamo” is about to work actively at transfer market. President of the team Igor Surkis said this during the match of selection for Euro-2013 between youth teams of Ukraine and Sweden. “Strengthening is necessary for several positions. Firstly – left fullback. Also we need some players in the middle of the field. And taking into consideration that we have a weak realization of goal moments, probably we also need a forward. In whole, during this low season, we should strengthen minimum 4 positions”, - said chief of Dynamo. TSN reminds that Ukrainians Yevgeniy Selin (left fullback) and Roman Bezus (attacking halfback), Croats Vedran Ćorluka and Niko Kranjčar, and also some Brazilians may become Dynamo players this summer.